There were young children at the usually empty synagogue, filled for an anniversary that symbolizes Jews' struggle for religious freedom. 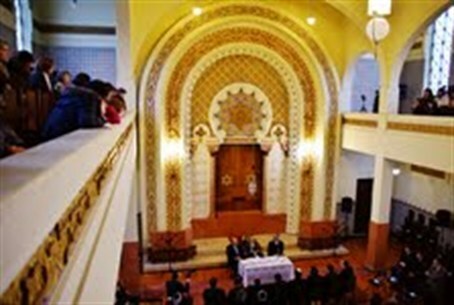 For one day the synagogue Kadoorie Mekor Haim in the northern Portuguese city of Porto was filled to the brim. Where otherwise only school classes visit and the small Jewish community gathers for Shabbat, nearly 300 guests from home and abroad came together recently to celebrate the 75th anniversary of the synagogue. It was no accident that the celebration in Porto coincided with the Holocaust Remembrance Day, as the president of the Jewish community Porto Dale Jeffries said at the beginning of the program. With the tragic Inquisition in the 16th Century and the fraudulent and anti-Semitic conviction of Barros Bastos, the synagogue's founder, Portugal played its part in the history of anti-Semitism. But precisely because of this past, Jeffries went on, and because the synagogue had been built in a time of virulent hatred of Jews throughout Europe and Portugal, the synagogue Kadoorie Mekor Haim was also a symbol for the struggle for freedom. Just a short drive outside the city center, away from the usual tourist hot spots and Port Wine Cellars one finds the synagogue, the largest Jewish house of worship in the Iberian Peninsula. It is a monumental building that combines both modern and Oriental Sephardic elements. Inside, one also finds the typical Portuguese wall tiles, the so-called “azulejos”. Although not physically present, the founder of the Jewish community in Porto, Captain Artur Carlos de Barros Basto, was the theme of most of the speeches. He founded the community in 1923 and left the synagogue as his lasting legacy for the Jews of Portugal. Together with several Portuguese architects he planned the building and overlooked the construction, which lasted from 1929 to 1938. Barros Basto had the hope that the construction of the synagogue would reinforce the revival of Jewish life in Portugal. His idea was to give the Jews of Portugal with this monumental synagogue “a high conception of the religion of their forefathers,” as he said at the inauguration 75 years ago. The synagogue was also to be a symbol for the connection of Portuguese Jews to the Jews in other parts of the world. Yet that same Barros Basto became a victim of anti-Semitism and was convicted in an unjust trial, whose verdict was finally repealed only last year. Besides the members of the Jewish community of Porto, there were present at the ceremony the Israeli Ambassador to Portugal, Ehud Gol, members of the Portuguese Parliament and guests from Jewish communities of London, the U.S. and Israel. Also present during the ceremony was a deputy of the ruling Portuguese party PSD, Carlos Abreu Amorim, who is also a member of the Portuguese-Israeli parliamentary friendship group. He authored the resolution which led to the rehabilitation of Barros Basto last year. Amorim explained to Arutz Sheva that his commitment was rooted in the ideals of the democratic revolution of 1974. “Without a rehabilitation of Barros Basto,” said the deputy in an interview, “the idea of ​​human rights in Portugal would not have been fulfilled.” This was also the theme of the speech of the president of the Portuguese bar association, Antonio Marinho e Pinto. He said in his speech during the ceremony that the flames of the Inquisition have not been fully extinguished yet and that it therefore was important to stand up for democracy, freedom and human rights. The Jewish community of Porto has had to struggle with many problems in the last ninety years, but all of the speakers confirm that it is on a positive path. Rabbi Abraham Serruya from Buenos Aires recalled his first visit to Porto forty years ago. Back then, he said, he had to cry when he entered the synagogue because the empty house of God was such a sad sight. Today, however, he is confident that the Jewish community in Porto had a future and he was glad to be present at this ceremony. A look into the hall of the synagogue seems to confirm the hopes of Rabbi Serruya. The community officially has only 39 members, but you can see on this day among the guests at the synagogue many young faces and little children. An important aspect of this is the grown self-confidence of the community. The celebrations are a sign that Jews in Portugal today quite naturally live and practice their faith. Carlos Abreu Amorim also agrees with this assessment. He believes, the member of the Portuguese parliament added, that the rehabilitation of Barros Bastos and the anniversary marks a new phase for the Jewish community in Porto and the Portuguese-Jewish history.